Chekhov's meticulous anatomies of complicated human impulse and response, his view of what's funny and poignant, his clear-eyed observance of life as lived, all matching our own experience. 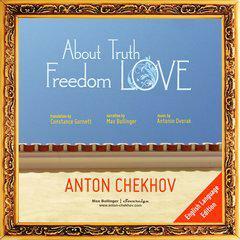 This audio book features a trilogy of interlinked stories: About Truth, Freedom and Love. Read in English, unabridged, and accompanied by orchestral music based on original compositions of Antonin Dvorak.